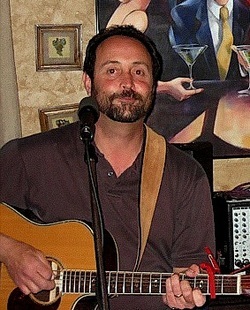 Archived Event - "Two Dave Moretti's"
As a singer - songwriter at heart I always like to play as a solo act whenever the opportunity presents itself for smaller venues, mid-week nights, or as an opening act for a bigger fish. I am all about playing a good song with a simple delivery that's being sung from the heart; whether it's an old favorite of yours, or something special to me that I have written about and want to share. Don't get me wrong, I am tremendously fortunate to work with some really great musicians and there is always power and fun in numbers, but getting down to a solo act makes me really have to dig deep and it keeps me honest. I love it all! I have recently relocated to North Shore Massachusetts from South County Rhode Island in 2014 and looking to forward to re-establishing in local music scene in the Greater Boston, North Shore, Southern New Hampshire and Southern Maine area. Please check out my Different Ensembles on this site by hovering over the Different Ensembles Icon in the menu bar above and then selecting either: The Amazing Tabasco Brothers, The Amazing Rhythm Mule, The Wingers, and The Dunegrass Boys. Please contact me at acousticmaniak@gmail.com or call 401-474-5974 if you are interested in booking any one of these bands, or myself as a solo at a venue, club, restaurant, house concert, or party.